Sometimes a song is so unexpected, so original, that it locks you in its grip; an iron claw that wont let you go until its play count is ridiculously high. My man Moose and I are always on the lookout for new music, always on the search for jams, and friends have shown us the light throughout college, with our Colombian buddy passing on Rodrigo y Gabriela to us, and this jam and a half here was also passed along by a friend. And what a Jam and a Half it is. “Home” mixes traditional call and response and country western, but spices it up with a high cheese factor and bounces along with infectious energy. A stark departure from most music out there, Ed Sharpe and his merry band created a jam that begs to be listened to over and over again. 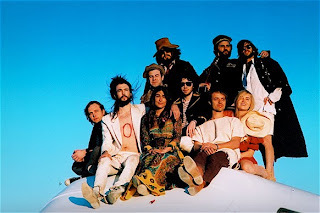 Born in LA, the band was founded by Alex Ebert, who created Edward Sharpe as a character who "was sent down to Earth to kinda heal and save mankind...but he kept getting distracted by girls and falling in love." Jade and Alexander, through their story about falling out of windows and last cigarettes, remind us of what’s important, and what home really is. Home is not a fancy hotel, home is about being around the people you love, the one you love, and not having a care in the world. Hopefully we all get to go home soon.